Win a Hoover Carpet Cleaner! Do you find your carpets are easily dirtied by pets, kids, spills, dirt, and just about everything else? Enter this contest for your chance to have the cleanest carpets of all time! 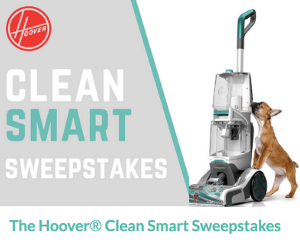 Hoover is giving away 1 brand new Hoover SmartWash+ Automatic Carpet Cleaner and you could be the lucky grand prize winner! To enter the contest, simply like their Facebook page and complete the contest entry form. You can enter once per day between now and the end of the contest period. This contest is not open to residents of QC. Can't wait to win this prize? Purchase your own Hoover Carpet Cleaner here. Want more contests? Check out all the current contests we have on the site!